It used to be jelly beans were for kids, not so for Jelly Belly Sport Beans. And now Lexco, the specialty bicycle distributor, has added the Sport Beans to its sports nutrition lineup. Jelly Belly Sport Beans, which are produced by the Jelly Belly Candy Company, the largest U.S. manufacturer of non-chocolate confections, come in four incredible flavors: Lemon lime, orange, fruit punch, and berry blue. Each bean is packed with electrolytes, carbohydrates, and vitamins B and C to provide a burst of energy while exercising. In fact, a recent study by researchers from the University of California Davis Sports Medicine Program found: "Sports Beans jelly beans were just as effective as popular sports drinks and gels in maintaining blood sugar levels and improving exercise performance (of the) competitive endurance athletes who participated in a study." Doesn't get any better than that. Plus, in addition to being such a great nutritional product for IBDs to sell Jelly Belly Sport Beans are also a great impulse buy. Lexco will carry the full line of Jelly Belly Sport Beans  the popular "portable power" in a bean for athletes  beginning in September. The company will stock the colorful POP counter display (24  1 oz. bags), floor display (36  1 oz. bags) and the Jelly Belly information cards. "We've been looking to add another quality product to our sports nutrition roster," says Karen Peterson of Lexco. 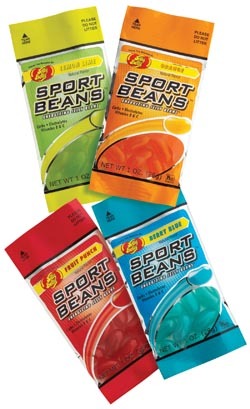 "Jelly Belly Sport Beans are the perfect addition. The nutritional supplements are proven winners for both athletes and IBDs, and we are proud to offer them to our dealers." Says Wendy Youngbauer, Midwest Direct Account Rep-Specialty Sales for Jelly Belly: "The Jelly Belly Candy Company developed Sport Beans for its cycling team. The team was seeking a portable and neat nutritional product and Sport Beans was the answer to their quest. We are excited that Lexco will be distributing Sport Beans to its growing base of bicycle dealers." For pricing, call Lexco at (800) 626-6556. Lexco offers value-driven bicycle products and services to the marketplace. Lexco is a family-owned and operated business that began as a hardware store and Schwinn franchise on Chicago's west side in the 1950s. It continued as a Schwinn bicycle shop on the city's north side in the 60s, and in the 70s, Lexco began making bicycle security cables and has grown that into Lexco's cable division showcased at www.lexcocable.com. Lexco became a full-scale bicycle parts distributor in 1978. For more information, call toll-free (800) 626-6556 or log onto the Internet at www.lexcobike.com.